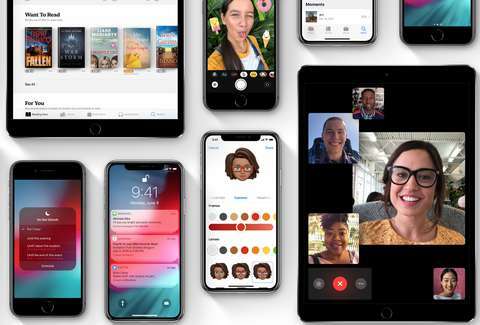 Although the big focus of Apple's much-anticipated event on Wednesday is its lineup of new iPhones, the company also announced some major news for all the old iPhones out there: iOS 12 is here. The free software update will bring dozens of new features, all sorts of performance enhancements, and a fresh coat of paint to your current iPhone, so maybe it won't feel so old after all, despite the arrival of the new generation. Apple will officially release the free software update on September 17. The company first previewed iOS 12 at its 2018 Worldwide Developers Conference (WWDC) back in June, showcasing new features like Screen Time, Siri Shortcuts, Memoji, shared augmented reality experiences, a bunch of new effects in the Camera app, overall speed boosts, and more. However, Apple has since admitted one of iOS 12's marquee features, Group FaceTime, won't be ready on time and will instead arrive via a later software update. All said, though, iOS 12 is a worthy update that should be a no-brainer for anyone with an iPhone or iPad. As with previous iOS updates, downloading and installing iOS 12 is simple. Just go into your iPhone's Settings app, tap on the General tab, then tap where it says "Software Update." From there, you'll be able to download, then begin installing the update, but only if you iPhone or iPad has at least 50% battery life (if it doesn't, you'll have to connect it to a charger). Once the update is installed, you'll likely have to tap through a few introductory screens spotlighting new features and changes before arriving back to your home screen. That's it. Your old iPhone will be new again. Well, new-ish. Screen Time: In response to growing calls for tech companies to help people track, manage, and potentially better limit the time they spend starting at their devices, Apple is delivering with a bunch of new screen time management features aptly dubbed Screen Time. For example, a feature called App Limits lets you set a time allowance for individual apps and when you've used all of that time, you'll receive a reminder that it's time to close the app, and you know, do something else for a change. The notification will take over your whole screen, but you can still dismiss it and continue using the app beyond your allowance if you want. But that would defeat the purpose now, wouldn't it? Siri Shortcuts: Finally, Apple is beefing up Siri in a big way with iOS 12. With new Siri Shortcuts, you can create personalized commands that trigger multiple apps and actions at once. For example, you can create a shortcut that's initiated when you say "heading home" that will start navigation in maps, read you information about road conditions, set your thermostat at home, and automatically text your roommate or significant other with your ETA. Major Performance Improvements: Usually, performance boosts are considered as much of a "feature," but after multiple glitches in iOS 11, Apple has taken extra steps to make improvements under the hood. Highlights include 70% faster swipe to camera speeds, 50% faster keyboard display, and up to 2x faster app launches when your iPhone is bogged down by a heavy workload. Even better yet, you'll get all of these speed bumps even if you have an iPhone 5s from 2013. Check back for more updates on everything you need to know about Apple’s 2018 iPhone announcements, including the differences between all three new iPhones, the new color options, how it stacks up to the iPhone X, when you can pre-order them, how much they’ll cost, the new iPhone sizes, and more.